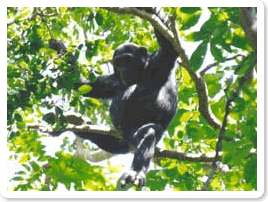 Description: Mahale National Park is home to some of the last remaining wild chimpanzees: a population of roughly 800. Tracking the chimps is a fascinating experience. It’s likely that you will observe them grooming each other in small groups, squabbling noisily, or bounding from tree to tree swinging on vines. You can also take a dip in the unbelievably clear waters of the world’s longest, second-deepest and least-polluted freshwater lake! Location: Can only be reached by shared charter flight from Arusha. Combines well with a visit to Katavi National Park. Time: Requires 3 or 4 night visit. Avoid Apr-May rainy season, though the November rains can be managed. Animals: Chimpanzees, Red Colobus, Red-Tailed and Blue Monkeys and many colorful Birds.